Treatment for Spinal Cord Injuries- Spinal cord injury is one of the progressively degenerating disorders which occurs due to the damage to the spinal cord because of a trauma or injury. A spinal cord injury is non-reversible process as the spinal cord does not have the ability to repair itself if it is damaged. The spinal cord is a group of millions of nerve cells (neurons) inside our spine which helps in the conduction of signals to and from the brain. Any damage to the spinal cord is often permanent leading to paralysis as it is a delicate tissue. The damaged cells release toxins because of inflammation at the site of a spinal injury which can cause harm to surrounding cells. Researchers are developing a treatment for spinal cord injuries to minimize such additional damage by reducing the inflammation and saturating the toxins and free radicals. The neurons and the supporting cells that wrap and insulate the neurons get damaged during a spinal cord injuries and give rise to certain clinical symptoms like trouble with walking and proper movement, inability to differentiate sensations and feel heat, cold and touch, loss of the control of the bowel or bladder movements, moments of inflated reflex actions or seizures, moments of growing numbness and tingling to extreme, signs of breathing problems and coughing. Complete injury: All sensory functions and motor functions are lost below the area of the SCI. Incomplete injury: Some sensory and motor functions are lost below the damaged area of the spine. The most common reasons for a spinal cord injury can be motor vehicle accidents, football, falls gymnastics, violence, unsupervised sports activities. Stem cells have shown tremendous results in this field as they replace neurons and their supporting cells to greatly improve a patient’s chances of recovering function. Paralysis, Inability to move arms or legs, unconsciousness, loss of control of the bladder or bowels, headache, pain, pressure, stiffness in the back or neck area, signs of shock, an unnatural positioning of the head. The quicker the patient obtains treatment for SCI, the better the chances for recovery in case of spinal cord injuries. The physical examination will include testing to see if sensation to touch is intact in the arms and legs as well as testing muscle strength and reflexes in the arms and legs. Cervical collar or a backboard is used to immobilize the patient until the confirmation of spinal cord injury. After this few tests are done to confirm about the SCI and start with the proper SCI treatment. CT Scan: This approach shows the location and extent of the damage and reveals the problems such as blood clots (hematomas). An MRI (magnetic resonance imaging) Scan: A computer creates an image of the spine to evaluate the soft tissues including the ligaments, intervertebral discs, nerves and spinal cord. The MRI scan also can show evidence of injury to the spinal cord. Somatosensory evoked potential (SSEP) testing: Shows if nerve signals can pass through the spinal cord. Treatment of spinal cord injury in India involves medication, surgery, and always requires physical therapy. Spinal Cord Injury may be due to either traumatic causes or non-traumatic causes (arthritis, cancer, infection, blood vessels problems, bleeding, and inflammation). There is no cure for spinal cord injury at this time. Spinal cord injury treatment helps in preventing further injury and making the quality of life more productive and active for the people with a spinal cord injury. Medications: Intravenous (IV) methylprednisolone is given for an acute spinal cord injury to provide symptomatic pain relief to the patient. It reduces the pain by decreasing inflammation near the site of injury and controlling the nerve damage. Immobilization: Traction on the spine. A rigid neck collar and a special bed are used to give proper alignment and stability to the spine and neck. Surgery: To remove fragments of bones, foreign objects, herniated disks or fractured vertebrae that can further harm the spine by putting uneven pressure on it, and prevent future pain or deformity. Ongoing care: After stabilizing the patient the secondary problems related to the SCI are given attention such as such as deconditioning, muscle contractures, pressure ulcers, bowel and bladder issues, respiratory infections and blood clots. Therapists usually emphasize maintenance and strengthening of existing muscle function, redeveloping fine motor skills and learning adaptive techniques to accomplish day-to-day tasks. Through conventional anti-inflammatory medicines, it is impossible to completely cure spinal injuries and these medicines can affect the other vital organs of the body due to continuous hormonal modifications. Stem cells are believed to be natural transformers and are by far the best alternative for the treatment of spinal cord injuries as stem cells can naturally regenerate lost neurons, generating new supporting cells that will re-form the insulating nerve sheath and act as a bridge across the injury to stimulate re-growth of damaged axons. 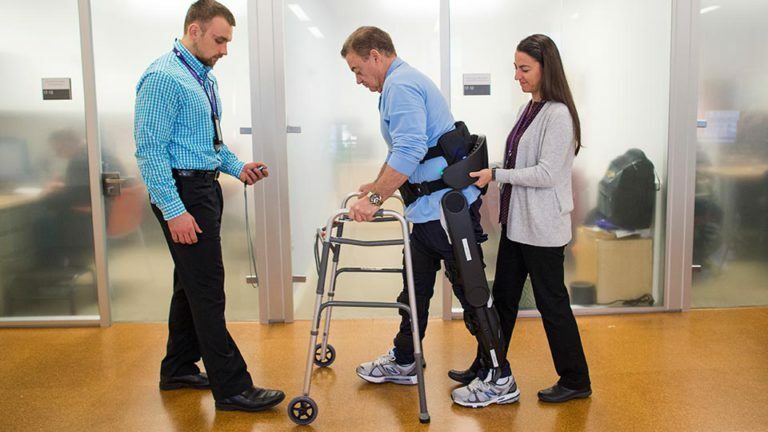 The spinal cord injury treatment with stem cells focuses on delivering the sufficient number of Adult Autologous Stem Cells extracted from one’s own bone marrow or adipose tissue to the injured area for better healing and regeneration of the desired cells. In bone marrow, the stem cells are extracted from hip bone or iliac crest after general anesthesia and in adipose tissue, the extraction is done from belly area with local anesthesia. The extracted cells are processed to be enriched with the pure line of stem cells and re-injected into the patient either by intravenous (infusion through the vein) or intrathecal (infusion through lumbar puncture) injections. Post-treatment, the patient is asked to visit the doctor after a specific period of time for some rehabilitation programs, including analysis of the recovery of motor, sensory and bodily functions of the patients. The SCI stem cell therapy reassures the safety of the patient with promising results. The benefits of stem cell therapy for SCIincludes decreased chronic pain and cramps, decreased muscle tensions, improvement in overall blood circulation, increase in muscle strength and overall improvement in motor and sensory functions of the patients. We request you to update us with your Friend latest medical reports. we will get back to you with the full treatment protocol and cost.